We like comics around here and have a first look at a new one—and hopefully a good one—for you. 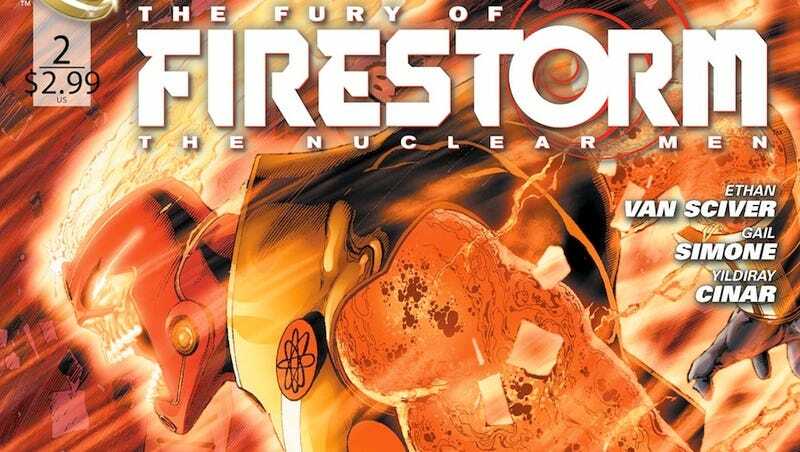 This is Fury of the Firestorm: The Nuclear Men #2 from DC Comics, which picks up with two high school students dealing with the fact they've not just turned into two nuclear-powered heroes but have merged into an even more brutish one. The comic is written by Ethan Van Sciver and Gail Simone, drawn by Yldiray Cinar. It'll be out on October 26. Enjoy the preview. I like good Firestorm comics and enjoyed a lot of John Ostrander's run in the 80's. Are you reading the new one? What do you want out of Firestorm? Click each page for a larger version.